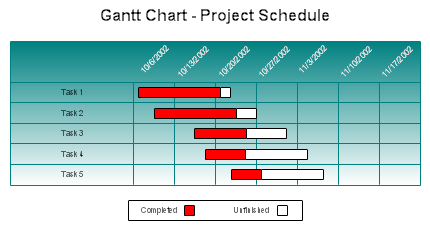 Gantt charts show task and schedule information. The tasks are usually numbered and listed vertically. A bar shows the starting date and projected completion date of each task. Color or shading is sometimes used to show how much of each task has been completed. A Gantt chart is a management tool and a communications tool. These charts can be downloaded and edited. It is often easier to modify an existing chart than to draw a new one. If you haven't done so already, download the free trial version of RFFlow. Once it is installed, you can open the samples on this page directly in RFFlow by the links to the right of each picture. From there you can zoom in, edit, and print the sample chart. RFFlow can also create a Gantt chart from data. 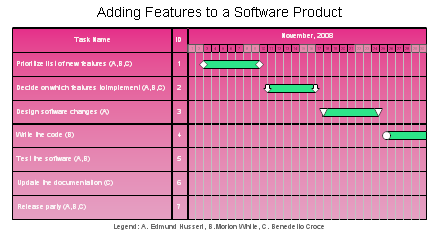 To learn more about this see How to Draw a Gantt Chart. See also: How to Draw a Gantt Chart.